The new house comes with satin nickel door knobs. I’m not a fan. 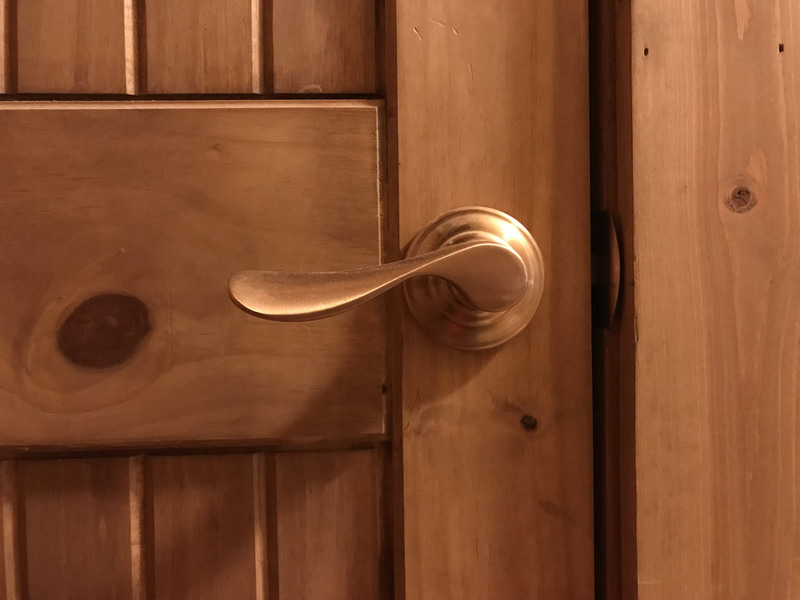 They have some very nice options you can choose instead, but I really love the rose gold door knobs on the log cabin. I decided I would move the satin nickel ones to the log cabin, and bring the rose gold ones with me. Satin nickel would go well with the cabin. It can kinda go with some of the galvanized metal things I have here. Then I found out I can’t get any more of the rose gold door knobs. They have been discontinued and the new house has way more doors than the log cabin. 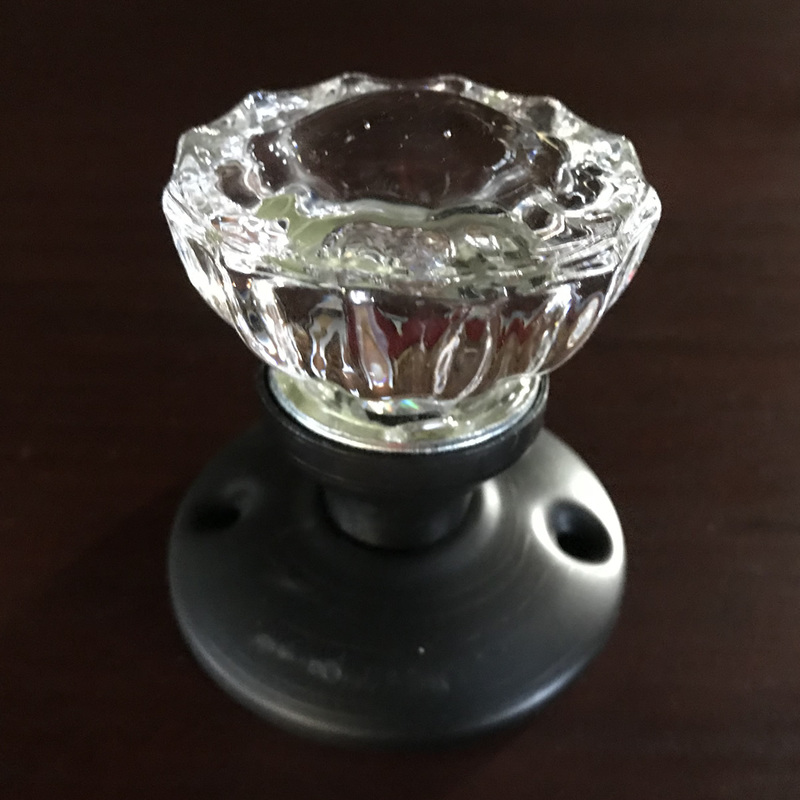 So, I started looking at options on-line and YOU CAN GET GLASS DOOR KNOBS!!! They aren’t even expensive! There are a lot of options, but this is what I picked. 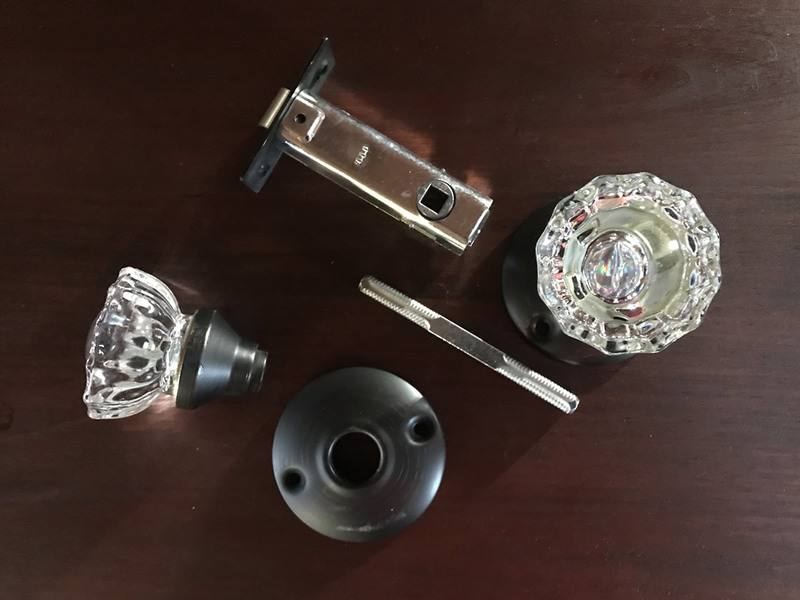 They look just like the door knobs in really old houses I have rented over the years. It looks really straightforward to change them. For Cliff to change them… See? Just two steps. The doors will still have stainless steel hinges. Not sure I can live with that. 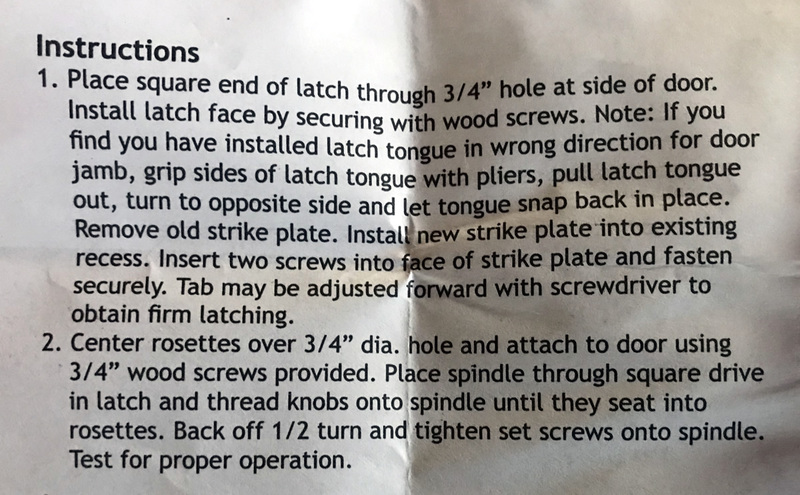 But I have to wait and see what size the hinges are before I do anything. I’ve gotten used to levers. I open the door with my elbow all the time when my hands are full. I might really miss that. But door knobs are easy to change. If I can’t get used to them, I will come up with something else. If you go to order these, make sure you get the ones that come with all the parts you need. Some are made with just the knobs. That only works if you have really old parts in your door. Other ones just screw on. Like for a cabinet door. These have the parts you need. When you click through, they show you even more options, but these are the best deals I found. I put in one that locks, but you can see it is way more complicated to install. All the other ones will go right into the holes you already have in your door, but the ones that lock require you to cut the door. They don’t lock. 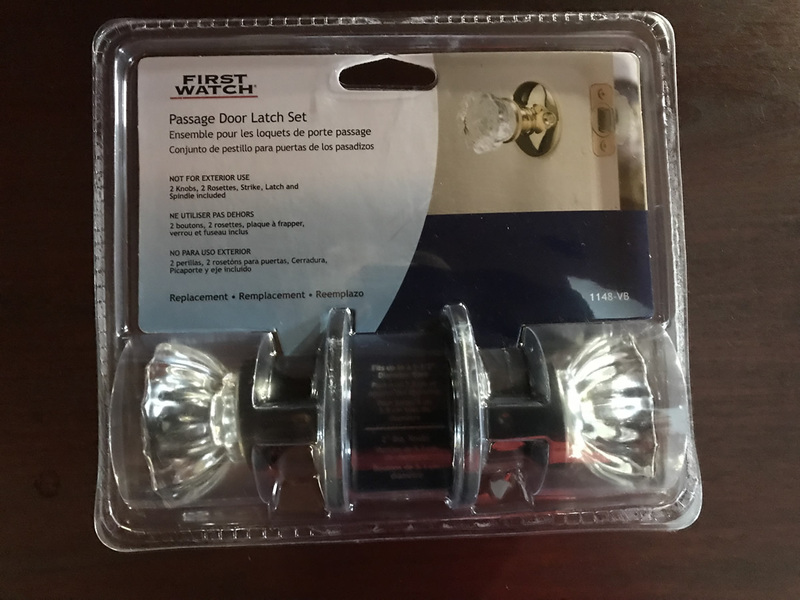 They make ones that lock, but I decided I would rather use some kind of latch for the bathrooms and not bother for the rest of the doors. For the bathrooms I would love to have something like they put on the bathrooms in airplanes, so you don’t have to knock on the door to know it’s in use. Not with a light, just some kind of indicator. I found these on Pinterest. It also comes in Oil Rubbed Bronze Finish, which might match the door knobs better. The next options would work, but they really don’t make me as happy. This is probably more practical. Cliff works for Schlage, so he really prefers their products. Not nearly as appealing, though. Perhaps I could paint these? They sure are less expensive. They could be made to work, but they don’t come in finishes I like. Since I wrote this, two days ago, I found two more options. 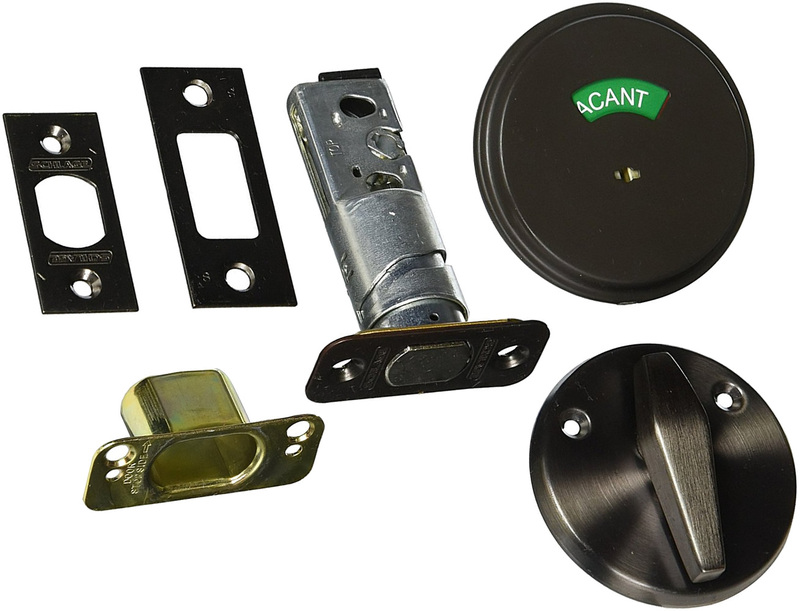 They are both by Ironmongery World and available on Amazon. It looks very like the cast brass one from England, but it is cast iron. I ordered the one that has the red and green. That part can be replaced or printed over and it can say whatever we want. The seller was a little less expensive than the other. I will let you know what I think when it comes in. And it’s Amazon. If I hate it, I send it back!